Publisher Vault Comics has announced its Winter 2017 Season of Comics, which features five titles from emerging and established creators. Vault will follow the Winter 2017 Season with an additional five titles in its Summer 2017 Season. 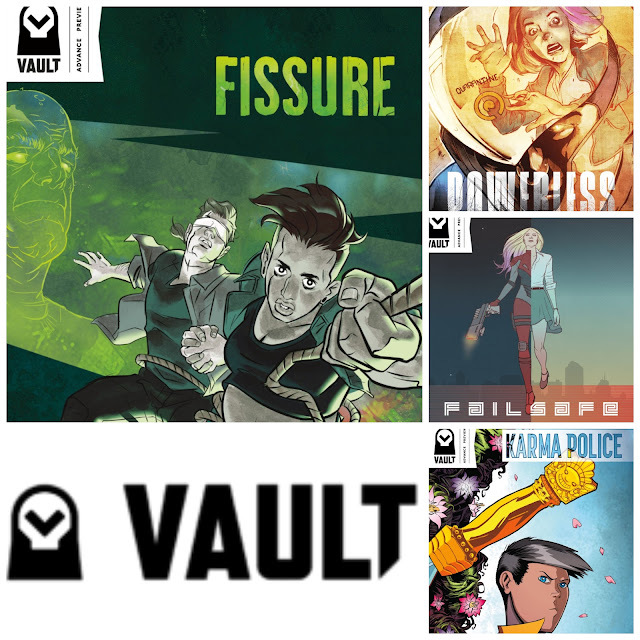 Founded in 2016 by Adrian Wassel, Damian Wassel, and Nathan Gooden, Vault Comics publishes original, creator-owned science fiction and fantasy comics. KARMA POLICE. Created by Chris Lewis (Drones [IDW]), and Tony Gregori (Lucha Underground [El Rey]). 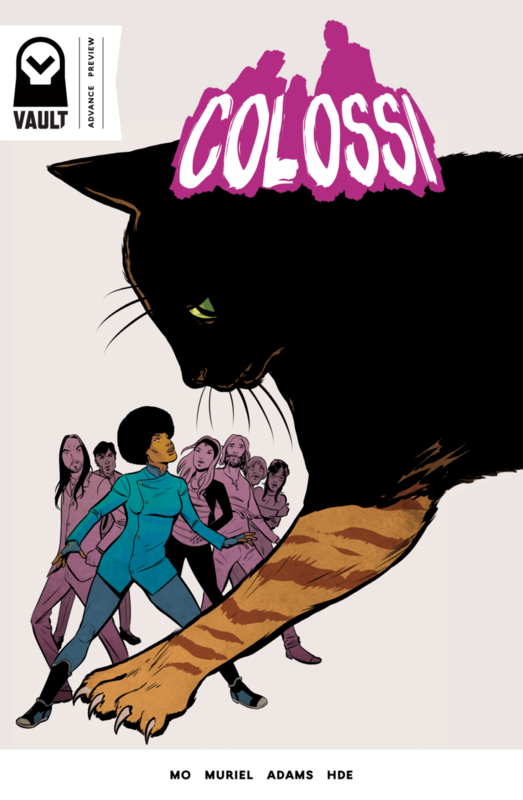 Written by Chris Lewis, with art by Tony Gregori, colors by Jasen Smith, and letters by Nic J. Shaw (The Fix [Image]). Writer Chris Lewis explores the cosmic implications of using violence as a means to pursue peace, in this series that is at once edgy, irreverent, and intensely humane. 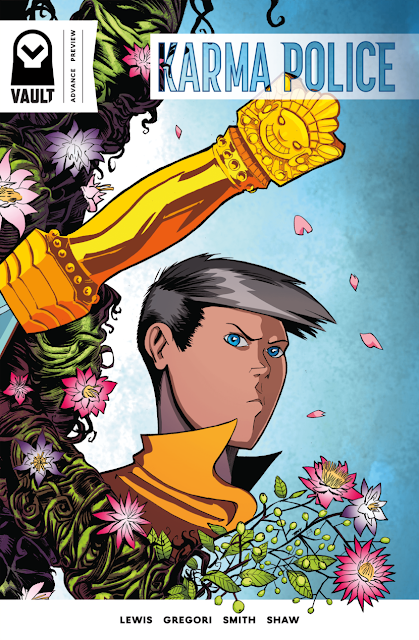 Vividly realized by artist Tony Gregori, with dreamlike colors from Jasen Smith, this kaleidoscopic fantasy-adventure features a cast of characters ranging from warrior monks to demonic luchadores. Karma Police tells the story of Jack Allen, a young woman who has been recognized as the reincarnation of a Tibetan monastery’s holiest monk. Trained as a compassionate assassin, Jack soon discovers an enchanted dagger from her previous incarnation’s bloody past. But she’ll have to resist its lure to stop the violence surrounding her in the present. In stores February 01, 2017. FISSURE. Created by Tim Daniel (Enormous [Image & 215Ink], Burning Fields [BOOM! ], Curse [BOOM! ]), and Pato Delpeche. Written by Tim Daniel, with art and letters by Pato Delpeche. Emerging master of terror, Tim Daniel, blends science fiction and horror in a story teeming with inescapable dread. Amid the political upheaval of an imagined future that feels too close for comfort, Fissure asks what happens when the ground on which American society is built literally crumbles under our feet? El Sueño, Texas, was a single street town withering under the shadow of the Mexico—U.S. Barrier. Then the pavement split, and a massive crack spread from one end to the other, rapidly swallowing El Sueño whole. Young couple Avery Lee Olmos and Hark Wright fight to escape the mysterious sinkhole and the malevolent force that beckons from its depths. 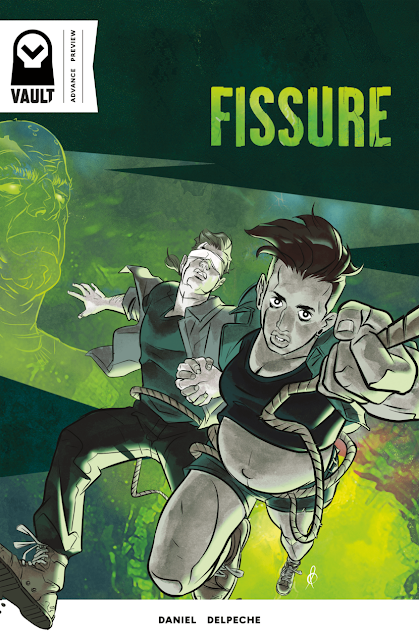 With startling art from newcomer Pato Delpeche, Fissure forces readers to examine the cracks running beneath it all. In stores February 08, 2017. FAILSAFE. Created by F.J. DeSanto (Transformers: Combiner Wars, Cyborg 009 [Archaia]), Todd Farmer (Jason X, My Bloody Valentine 3D), and Federico Dallocchio (Suicide Squad: Kicked in the Teeth [DC]). Writte by F.J. DeSanto and Todd Farmer, with art by Federico Dallochio, and letters by Travis Lanham. Veteran creators F.J. DeSanto and Todd Farmer turn their filmmaking talents to comics in this cinematic action epic. This near future thriller explores the perils of human enhancement and divisive politics. When he executed the last nanotech-enhanced super soldier, John Ravane thought that was the end of the haywire Insurgence Program. Ten years later, in the wake of social unrest, its true legacy is revealed. As sleeper agents scattered throughout the country activate, Ravane must stand between a government he cannot trust and the soldiers he once hunted. Federico Dallocchio's stylized art and sophisticated palette make familiar locations feel unsettlingly alien. 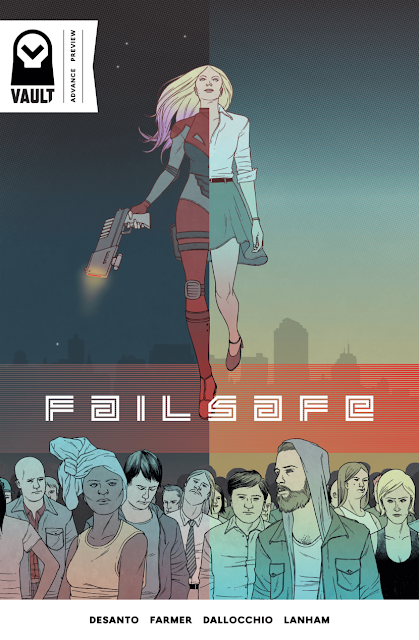 Portions of Failsafe were previously published as Insurgent from DC. In stores February 15, 2017. COLOSSI. Created by Ricardo Mo (Propeller [Comixology]) and Alberto Muriel (Propeller [Comixology]). Written by Ricardo Mo, with art by Alberto Muriel, colors by Jon Adams (Enchanted Tiki Room [Marvel], Cyborg 009 [Archaia]), and letters by HdE. Together again after their critical success, Propeller, emerging creators Ricardo Mo and Alberto Muriel channel the vibe of B-movie classics to deliver a high-tension romp with dark wit aplenty. When Trans Atmos Shuttle 34 disappears into a wormhole, its pilot and passengers are launched into an adventure of gigantic proportions. Lost in an oversized parallel universe, the group must put aside their differences and unite to survive a hostile environment. But the biggest threat they’ll face is the one that hitched a ride on Shuttle 34. Colossi is Land of the Giants during an Invasion of the Body Snatchers. In stores February 22, 2017. POWERLESS. Created and written by David M. Booher, with art by Nathan C. Gooden (Killbox [AGP]), colors by Mike Spicer (Suicide Squad: Most Wanted [DC], Mad Max: Fury Road [Vertigo], Head Lopper [Image]), and letters by Deron Bennett (Jim Henson's Tales of Sand [Archaia]). First-time creator David M. Booher partners with award-winning artist Nathan C. Gooden to turn the superhero comic upside down. Protagonist Billy Bannister lives in a world without superheroes. Not because powers don’t exist. But because everyone has them. After the outbreak of PRV, a virus that rips away those abilities, Quarantine emerges to stop the spread. An elite agent, Billy is the last line of defense against contagion. But his loyalty is tested when the infection hits too close to home. 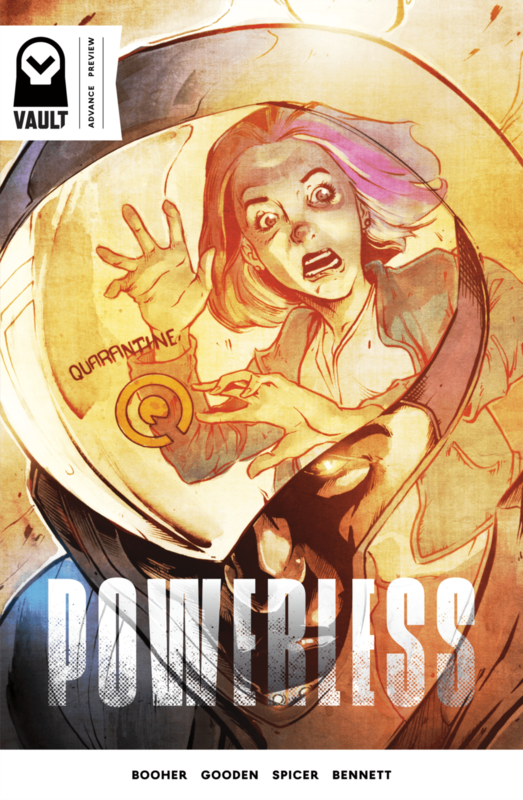 On the surface, Powerless is a high-concept action comic; at its core it pushes readers to reconsider questions of power, race, social identity, and what is essential to humanity. Gooden's incredible artwork is brought to life with jaw-dropping colors from veteran colorist Mike Spicer. Powerless is produced in partnership with Blood Moon Creative. In stores March 01, 2017.